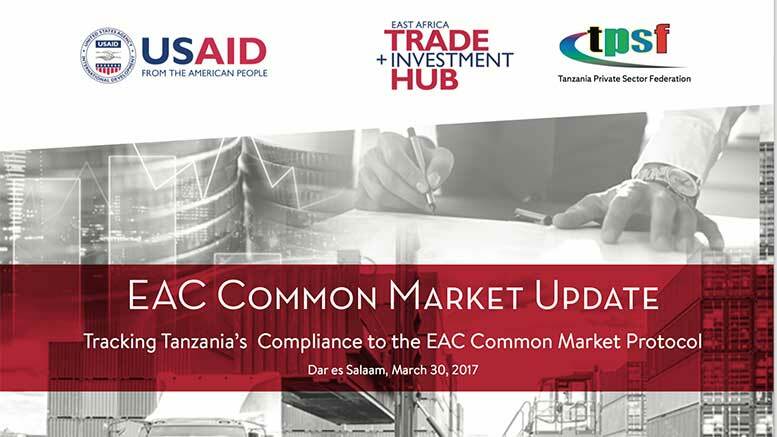 The USAID East Africa Trade and Investment Hub has recently published, in collaboration with the Tanzania Private Sector Foundation (TPSF), its East African Community (EAC) Common Market Update. The presentation tracks Tanzania’s progress in implementing the EAC Common Market Protocol and highlights key areas of policy reform that Tanzania is exploring towards easier movement of goods, services and capital in the East African region. -EAC investors were blocked from USD 213 million Vodacom IPO, violating Tanzania’s forex regulation reforms of 2014. -The Media Services Act of 2016 – awaiting a ministerial commencement date – and the Media Services Regulations GN N0 18 of 2017 introduce measures inconsistent to the EAC Common Market Protocol. -The energy sector sees further tightening of market access across EAC, Tanzanian measures included. The Hub suggest to reverse the exclusion of EAC investors from Vodacom IPO, expedite the establishment of a framework for trading derivatives in Tanzania, amend the Media Services Act and the Media Services Regulations, and institute a “common market test” for bills and draft regulations. -At least five Tanzania laws – all with measures inconsistent to the EAC protocol – were enacted to law end 2016 and early 2017. -Kenya’s High Court emerges as unlikely reform champion with 2 pro-common market rulings that favor Tanzania. The Hub recommends a Common market test to aid the legislative process, and increase impact work to determine the overall implications of liberalization. However, the presentation reminds that the Report of 22nd EAC Regional Forum on Elimination of NTBs, 29th November – 1st December 2016 reveals that a number of Sanitary, Phyto-sanitary Standards (SPS) measures were imposed by Tanzania. The Hub recommends a more robust verification of the removed of NTBs, and the review of existing SPS measures. The USAID East Africa Trade and Investment Hub works to boost trade and investment with and within East Africa. The goal of the Hub is to deepen regional integration, increase the competitiveness of select regional agriculture value chains, promote two-way trade with the U.S. under the African Growth and Opportunity Act (AGOA) and facilitate investment and technology that drives trade growth intra-regionally and to global markets.